So I'd mentioned in the 'Why' of the 5 W's series that I have always loved paper-crafting. But there are so many forms of paper-crafting...how did I come to quill? I was in Etsy chat back in the day (circa 2007), talking about the angel ornaments I was selling at the moment. One of the fellow chatters mentioned they were very unique...were they quilled? I didn't know what quilling was. She linked me to the Wikipedia entry. 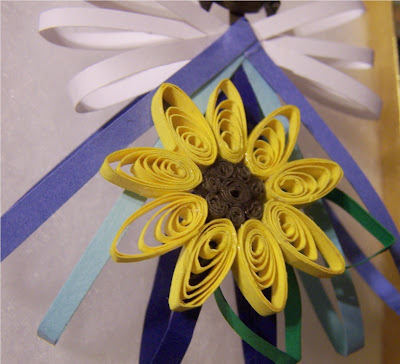 Quilling wasn't exactly what I was doing, but it was similar and I was intrigued. I stopped making the angel ornaments a short time after that. They just didn't get the response I was hoping for. I had incorporated quilling into the design of a few of them. But put it all aside until last summer, when I needed to make some people for the Etsy video and though...I'll try making them out of paper. That's my story. I think it shows how the art/craft/design community can influence each other, expand the ways we do our work. Who knows? Maybe the ornaments will make a comeback one day.